Over the last few years, we've seen the Charedi Gedolim issue a number of bans. Making of a Godol, zebu, One People Two Worlds, my books, Indian sheitels, Lipa, and probably others that I've forgotten. But the latest is particularly significant: a ban on Mishpachah and similar weekly magazines. You could see this one coming a mile off. As I wrote on a previous occasion, while there's much to criticize about Mishpachah, it's certainly dramatically pushing the envelope of acceptability in Charedi circles. They feature positive articles on people who are not Charedi, as well as indicating that it's acceptable lechatchilah to work for a living. The English edition has printed all kinds of subversive articles, such as Jonathan Rosenblum's "Bans are not Chinnuch." Of course, it's always written in such a way as to be superficially loyal to the Gedolim, and Mishpachah has many fawning articles and obedient declarations about them, but it's not hard to see the underlying agenda to transform the charedi world. Still, as usual, there are also other factors at work. According to this article at B'chadrei Charedim, the ban was orchestrated by Yated Ne'eman, who are panicking at losing readership and advertising revenue to the competition. But Yated has apparently shot themselves in the foot; they printed Rav Nissim Karelitz's signature even though he (allegedly) specifically asked them not to print it if Mishpachah was being named. So much for obedience to the Gedolim! Nevertheless, the ban have several signatures, and the main victory for them is getting Rav Elyashiv's signature. Which leaves the charedi world in a quandary. With previous bans, everyone always folded. The only exception was me, but in my case I was anyway leaving/ being thrown out of the Charedi world. You can't stay in the Charedi world and yet overtly reject the authority of the Gedolim. Mishpachah has always officially said that we charedim follow the Gedolim. So what happens now that the Gedolim say that Mishpachah is forbidden? I don't think that Mishpachah itself will fold. They'll weather the storm. But will people stop buying it? Probably not too many. Most people know how these things go down; that it's all about power and control. But how can Mishpachah continue to write about the Gedolim as authoritative Daas Torah, while ignoring what the Gedolim have specifically said about them? And how can the people who in other cases (such as mine) said that we have to follow the Gedolim, continue to read Mishpachah? Many people realized a long time ago that the Emperor has no clothes. Yet they continued to act as though he did. But now, it's going to get much more difficult to pretend that everyone still believes him to be clothed. I must have missed this one. The attempted to ban an animal? Or is this a reference to something else? Yes, they kicked the cows out of Bnei Brak. Seriously: They claimed that kashrus agencies were slaughtering zebu, and that according to the Chazon Ish, zebus are not cows, and therefore lack a mesorah and may not be eaten. In fact, Chazon Ish said nothing of the sort. Do we even need a mesorah for mammals? I understand where, for birds, you would want a mesorah, so as to make sure you're not eating one of the forbidden birds (which are identified by name only). But for mammals (and, for that matter fish as well), do we really need a mesorah? As long as it has the simanei kashrus, who cares if there's a mesorah or not? We don't need a mesorah. It's a peculiar chumra of the Chachmas Adam that was accepted by the Chazon Ish. "how can the people who in other cases (such as mine) said that we have to follow the Gedolim, continue to read Mishpachah?" Simple. The whole idea of Daas Torah is a charade, it should be renamed as Daas Atzmi. whenever one disagrees with a gadol they do one of two things. 1 they say he has bad info. 2. they downgrade his status as a gadol. So why pretend to subscribe to DT? It's a way of claiming moral superiority and if anything goes wrong to have a proper defense - "I listened to a gadol." In short, Mishpacha is not acting any more honestly or maturely than Yated Ne'eman (Hebrew). To be fair, I should not compare the 2, as Yated Neeman (Hebrew) has no concept of objectivity or truth, and makes me sick. In a storm of frumkeit, I have banned it from my home - even the Tuesday freebies. I have read about the recent ban on Mishpacha Magazine from a number of Gedolei Yisroel with great interest, and am curious how the rabbinic board of Mishapacha will deal with this. I saw this ban on the website Deiah Vedibur - see link here: http://chareidi.shemayisrael.com/archives5771/emor/EMR71omishpcha1.htm. I write with the assumption that Mishpacha Magazine works with and bows in submission to daas Torah. If such is the will of daas Torah, then will Mishpacha Magazine shutter its doors in response? It would seem to me that this ban, if true and not forged, places Mishpacha in an uncomfortably unique position. How can Mishpacha continue to espouse reverence and submission to daas Torah when daas Torah has declared that Mishpacha distorts and blurs the words of the Torah, and should presumably not be brought into a Jewish home? I read that to mean that it is the will and desire of daas Torah is that Mishpacha cease to exist. If Mishpacha continues business as usual, will the publication not be operating in defiance of daas Torah, and, ipso facto, abrogating the respect that your own publication professes for Gedolei Yisroel and daas Torah? I was rather surprised some weeks ago when I read an informative article on kitniyot oils in one of Mispacha's subsidiary magazines. What was remarkable was the article's treatment of Rav Kook in regards to that controversy. Not only did the article treat R' Kook with utmost respect, the article left open an implication (or perhaps inference) that opposition to Rav Kook's position (on kitniyot oils) may have been politically influenced. Perhaps one can differentiate between Israelies and Americans ; it didn't say explicitly that it was intended for Americans in America, and was perhaps aimed at the Israelies and the Israeli Mishpacha, which is also different than the American one. This is similar to concerts, where American charedim have a different practice than Israeli Charedim. Additionally, perhaps clarification of the Askonim's role will come, just as it came after the Lipa ban. Also, after the VIN ban, a compromise was tried. As I recall one media commentator said on the Zev Brenner show about the VIN ban: "this ban was like a slap across the brow, to get people's attention and start negotiating". So I am not 100% sure that this ban will continue even on the Israeli Mishpacha. So far I've resisted the temptation to subscribe ... this may be the push I needed. Brilliant ploy by the Mishpacha marketing staff! My bet: That Mishpacha will pay more money than Yated did for the "powers that be" (gatekeepers and handlers) to say that this ban was a forgery. I believe it's all about money. And the winner (highest bidder) is yet to be determined. And no, I don't believe R' Elyashiv or R' Kanievsky themselves are being bribed - I believe their gatekeepers and handlers are. 1. Chazon Ish said nothing of the sort. 2. It's a peculiar chumra of the Chachmas Adam that was accepted by the Chazon Ish. So did the CI say it, or didn't he say it? Chazon Ish said that Ashkenazim cannot start eating new types of mammals without a mesorah. But, contrary to what was being claimed during the zebu controversy, he didn't say that zebu was a new type. Harry potter, the Internet, Behadrei haredim, vos iz neis, now mishpaha. Pretty soon all forms of media will be banned except a single newspaper/shabbos drasha worksheet produced by supposed gedolim or their henchmen. 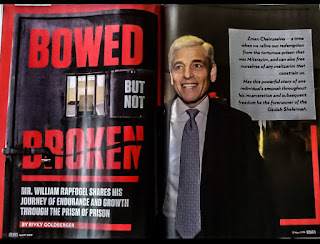 If its not kosher to read a frum magazine, well, what the hell, I might as well read bible criticism - at least its by goyim and not wayward jews who will corrupt my soul with their poisonous insufficient frumkeit. Goy sheker doesn't need to be banned because we all know its not claiming to be judaism and therefore does not threaten the holy daas torah comrades and their dictates. 1) People's desire to jump on the "ban-wagon" in order to feel frum enough. 2) Their desire to do keep doing what they do (e.g. reading Mishpacha), regardless of what the gedolim say (or even what the halacha says). Even if #1 gains some momentum, #2 typically wins out. So score 1 for good old pragmatic self-interest over religious ideology (hopefully)! I wonder how much this new "Ami" magazine has to do with this. Is this new? last week or so they had this on Hirhurim and the comments on the press was that it was a proved fake. I suspect that Mishpacha engineered the whole thing to increase sales. Let's see if they put warnings in the plastic wrapper - BANNED! Don't you dare buy this magazine! "this ban was like a slap across the brow"
Matzav.com (the unofficial online branch of the American Yated?) is now saying the sort of thing about the Mishpacha ban that bloggers were condemned for saying when you got banned. "It was subsequently revealed that some information was misrepresented and that some of the individuals had political motives for their effort to have the kol korei released, signed by gedolim." But how can Mishpachah continue to write about the Gedolim as authoritative Daas Torah, while ignoring what the Gedolim have specifically said about them? And how can the people who in other cases (such as mine) said that we have to follow the Gedolim, continue to read Mishpachah? I'm no psychologist, but this sounds like cognitive dissonance - holding conflicting ideas and/or behaviors simultaneously. I'm sure "rationalist" Jews suffer this all the time regarding even more significant topics (i.e. evolution, age of the planet/universe, existence of God, reliability of the Bible, etc.) - qal v'khomer in minor cases like reading a favorite magazine that is now being targeted by the "Gedolim." Also, did Mishpacha ever cover truly serious/pressing issues like the sexual abuse of children in the Orthodox world? That topic alone reduces these other "controversial" affairs to insignificance. First, this is old news. Rav Karelitz has already publicly announced that his signature was misused. Rav Kanievsky in on record as saying he'll sign anything that already has other signatures on it. The rest of the names are apparently all second tier. Most likely a retraction excluding Mishpacha will eventually be issued. Or it might be called a clarification. You can't retract if you're never wrong. More and more the following is getting said on the Chareidi side of things: if you didn't hear Rav X say it, don't believe it. The rest of the names are apparently all second tier. Rav Elyashiv is not second tier! Sorry, the term was "shot across the bow", ie, a warning shot in nautical terms. Then they have to work details out... The rabbis are doing what they feel their societal role is and performing their obligations. At the same time those in responsible positions understand that the internet is not going away." This letter also forbids web sites like Matzav. It's pretty funny seeing the purportedly right wing (Matzav) getting outflanked by the righter wing. It is not clear if the English Mishpacha is also being banned. Since the American Chareidi world is much more open-minded, I wonder if the Gedolim would have banned it for such an audience. I would assume that most American Chareidim, who don't work in such closed fields as Chinnuch, etc, have other sources of news other than Chareidi outlets. It's better that they get their news with a Chareidi bent than with a secularist/cynical bent. A man recently approached Rav Chaim Kanievsky with the following dilemma. He explained that his house had been infested with mice, and he had explored every option to get rid of them to no avail. He related that he had engaged expert exterminators to set traps and place poisons, but it had not helped, and the mice kept returning. In fact, the man told Rav Chaim, the situation was so unbearable that he and his family had to move out of their apartment. The man responded that he is scrupulous about giving maaser from all food that is brought into his home. “Are you also careful about giving maaser kesafim, maaser from the money you or your wife earn?” asked Rav Chaim. The man answered in the affirmative. Rav Chaim inquired as to whom the man gives his maaser money. The man said that he uses the maaser money to pay off his debts. Rav Chaim instructed the man, from then on, to be sure to give his maaser money only to poor people and to no one else. In that merit, he said, his mice problem would go away. Since he was in such dire financial straits, the man asked Rav Chaim if there was any way he could use his maaser money to pay off monies that he owes. Rav Chaim said that he may do so only if he is exceedingly careful about it and records every single shekel spent, with a plan to pay back the money later on when his financial situation improves. The man accepted the guidance of Rav Chaim and received his bracha before returning home. Several weeks later, the man returned to Rav Chaim. He told the gadol that he had followed his advice, keeping strict records of how much money he earned and how much money was maaser, and he had, in fact, given the money to some poor people. Within days, the mice suddenly disappeared from his home. It has now been some weeks later and the mice have not returned. An interesting twist to this story was when the man asked Rav Chaim whether, according to halacha, he can ask the exterminators for a refund, since they weren’t - and couldn’t be - successful in removing his mice, as there was apparently a reason for their presence unbeknownst to the exterminators? Rav Chaim said that the natural way to get rid of mice is by giving maaser money to poor people. He said that the man should go to the exterminator and issue an apology for wasting their time and ask forgiveness for the distress he caused them that they were unable to succeed in getting rid of the mice. "Many people realized a long time ago that the Emperor has no clothes. Yet they continued to act as though he did. But now, it's going to get much more difficult to pretend that everyone still believes him to be clothed." What precisely is the nimshal for "the emperor"? For the "clothes"? It's chidush that mice have to do with maaser. By us in Boro Park we just hang a picture of the Kereshtiner Rebbe (also known as the Mice Rebbe) and the mice just disappear. Why wouldn't this work in Eretz Yisroel as well? I don't think this tests the Gedolim's authority because these Pashkevilim have a momentum of their own. "He said, but it was really the Askonim"
"He signed, but that's only because Rav Kanievsky signed, and Rav Kanievsky signed only because Rav Karelitz signed and Rav Karelitz didn't really sign"
It seems to me that in your posts you display a timidness in criticizing R. Eliyashiv. Why? I would like to see you post about this. I don't think I'm timid. But a story like that is not remotely reliable. The only evidence for it is some unnamed avreich who by his own admission is a kannoi - hardly a reliable source. I'm not ruling out the possibility that it's true, but there is insufficient reason to believe it.